It’s taken me this long to post my “All Canadian Cheese Fondue” because this winter really has not inspired the craving I usually get every month during the long, cold Toronto winters. We finally got a cold, below zero, snowy evening today so I decided to jump on the opportunity to try out some cheese combinations. Since the Swiss have a fondue for every canton or region, I thought this fondue should rightfully be named “Quebec Fondue”. To the pot I added: lemon, garlic, white wine, kirsch, and a combination of Miranda from Fritz Kaiser, Louis d’Or from Fromagerie de Presbytére and Mont St.Benoit from The Abbey at St. Benoit- du -Lac. The primary taste was salty (more so than the Swiss fondue) but then when it mellowed out I was left with a sweet, highly buttery impression. Small pickles and Quebec duck prosciutto from The Village Cheesemonger in Libery Village was perfect alongside. The richness was cut with some fruity white wine from Italy although I wish I had a Pinot Gris from Organized Crime Winery in Niagara. If you’ve ever seen an older publication of food books from Switzerland, they usually look something like this. Shred cheese in a food processor and add a tablespoon of cornstarch, mix. Place fondue pot on stove and turn heat to medium. Rub pot with cloves of garlic and a squirt of lemon juice. Let heat until warm and start adding shredded cheese, stirring in an 8. Once all the cheese is melted, add some nutmeg and pepper to taste. Start the burner and serve with chunks of stale bread ! Accompaniments could be gherkins, pickled onions, beets, cabbage, cured meats, etc. First rubb some garlic to the bottom of the pan. Mix the Kirsch with some Maizena (cornflower, cornstarch) and add it to the already melted cheese. Instead of white wine add prosecco or beer. 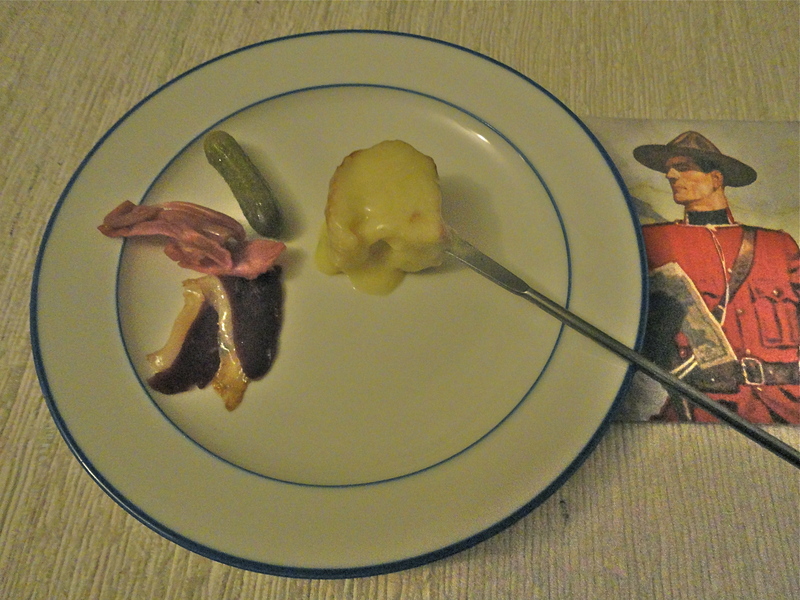 Pickles and pearl onion go well with the fondue. I’m not much in favour of duck prosciutto or cured meat. On the other hand, why not? Instead of bread try small pieces of pineapple or apple. Dip the bread in the Kirsch before into the fondue. If you drop your bread into the fondue you have to pay a round of Kirsch or to go around the table and kiss all ladies or/and gents. A good white wine goes well with the fondue. But it should be dry, not too fruity and not sweet. Ladies are allowed to drink tea instead of wine. It’s a crime to drink softdrinks with the fondue. A Guete! Canadian Cheese ...A journal of modern traditions.